Satellite activate. Welcome back Satellite Subscribers. Grab your sword and shield heroes as we are about to go waaaaay back in time to one of my fondest memories as a comic book kid. Comic book ads were always a sense of wonder for me and I scanned some of the ads more than some of the comics that they housed. 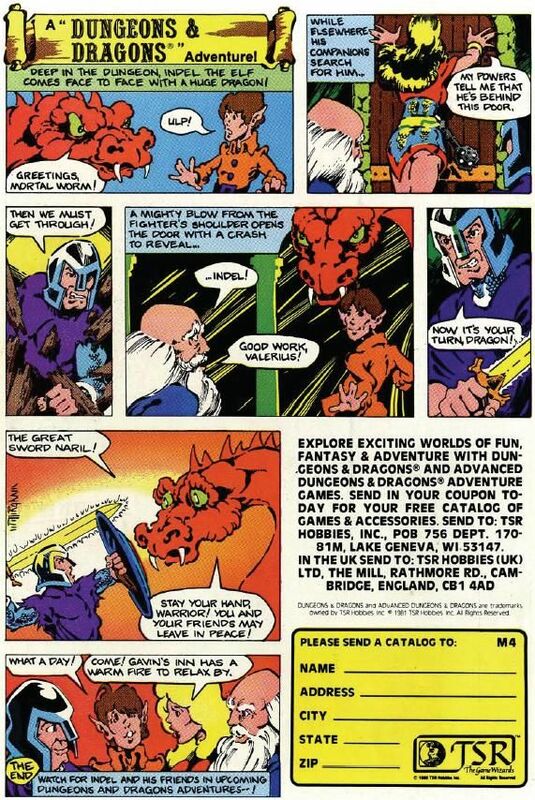 One set of ads that always haunted me were TSRs Roleplaying game ads for the classic game Dungeons and Dragons. 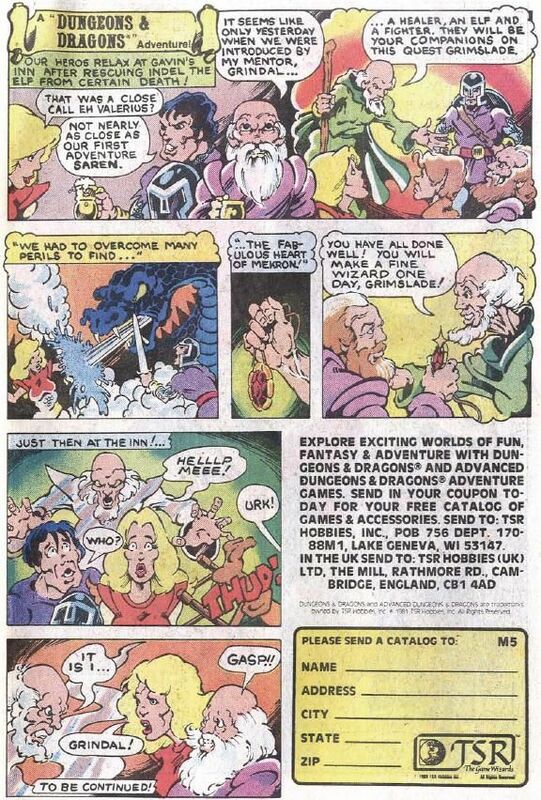 I played D&D twice in my life officially with actual gamers. The other times I do not count as the individuals I played with had no idea how to role play. This set of ads drew me in like the Death Star tractor beam, but I have never had them all in front of me at one time to actually read the story beginning to end. 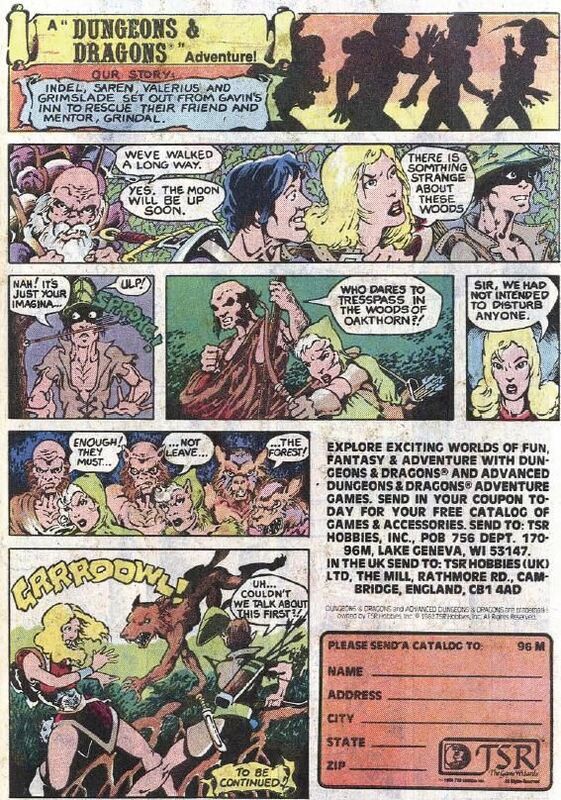 Thanks to the folks over at Crunchy Dice website (crunchydice.blogspot.ca/) who so lovingly preserved these ads. So if you have always wanted to read these things from start to finish in chronological order..the time is now. Seat belts secure..lets go back in time. The first ad was admittedly a little rough. 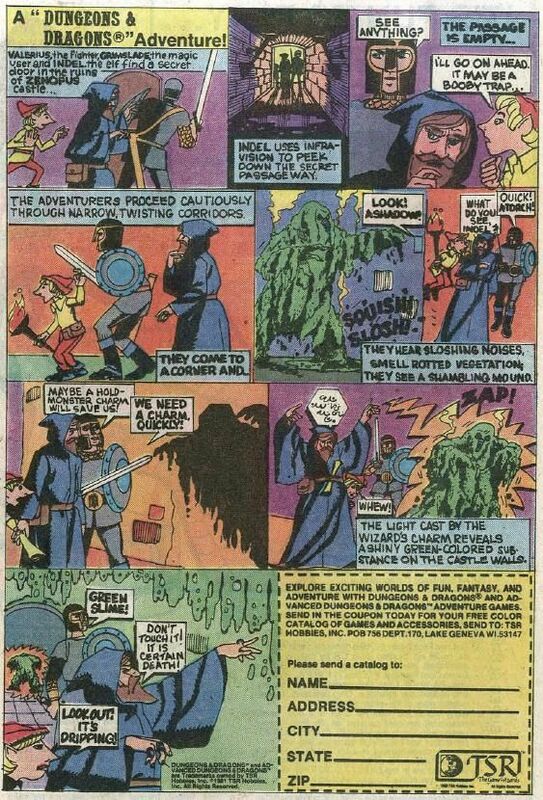 The art would improve in later ads but this is the official first appearance of Grimslade the Magician, Indel the Elf, and Valerius the Warrior as they use their cunning to defeat a slime monster and a castle full of green slime. No questions the group is joined by Saren literally out of no where as poor Indel the Elf is devoured by the dripping green slime. Luckily the healing Cleric powers of Saren saves our Elven friend from certain doom! You never know when you will need a random Healer in your group! That silly Elf Indel has gone missing clearly still dazed by his slime experience while the others run into a wave of Goblins who do not stand a chance against Grimslade the magician. Beginning to wonder does Valerius actually do anything with that sword? Hmmm. Mean while we see Indel fall into a pit only to go face to face with a Red Dragon! Easter egg: Check out Indels red lipstick as he falls. Hmmm. Our mace wielding female healer Saren, apparently has abilities not only to heal but to see through doors and picks up Indels location long enough for the noble Valerius to burst through the heavy wooden door to stop the certain doom of Indel at the hands of the Red Dragon. The Dragon sees Valerius is sporting the Great Sword Naril and backs off. The group celebrates their victory as they round up Indel and head out of the slime, goblin and dragon filled castle to relax in the warmth of Gavins inn. The first adventure comes to a close. The art at this point has improved significantly and their use of panel layouts and even the lettering are up to standard by this time! Forget relaxation our band of Dungeon thrill seekers are remembering how they came together after they were introduced by Grimslades Mentor Grindel, a fellow magician. 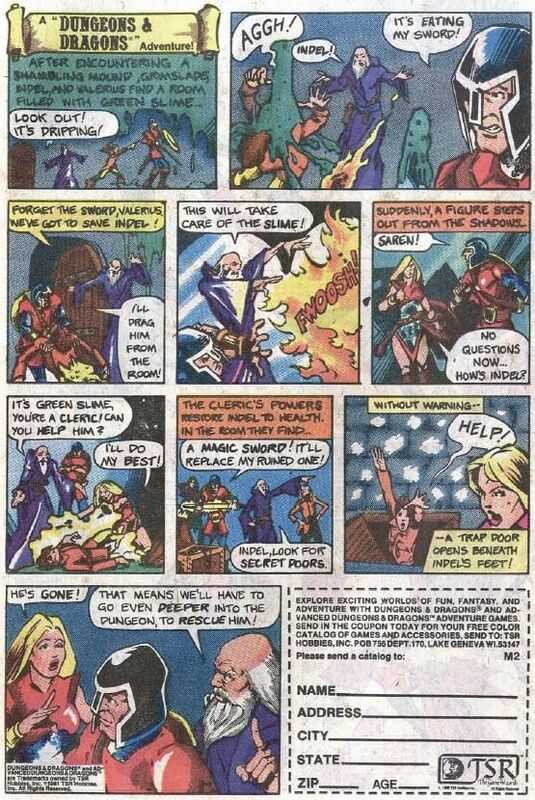 We see some backstory with student and mentor as Grindel predicts Grimslade will one day be a great Wizard and shows how he bestowed on him the Fabulous Heart of Mekron. With all their memories set aside for the evening the group is suddenly visited by the ghost of Grindel. But what does this mean for our group? The group deciding that they need to help their old friend Grindel after their ghostly visit at Gavins Inn set out to find Grindel and get him out of trouble. However in the dark forest has someone or something guarding it. Werewolves! The group is suddenly attacked and it looks like Indel and Saren are in some trouble! The art by this point was good enough to be in an indy book. The characters look more defined and all the way around the board we have us a good series. Honestly I have never seen this particular ad before so this is actually my first read of this one. Loving it too! Anyways back to the story. The powerful Werewolf Oakthorn and his companion are handily defeated by the girl Saren and Elf Indel by simply moving out of the way casting a spell and slashing at them unsuccessfully! The Werewolves are run off and the group is alive no thanks to Grimslade and the powerful do nothing warrior Valerius. But wait what is that up ahead..as they move carefully through the Blackswamp of Lobella, Grimslade spots the Mountains of Ash..can Grindel be there? Spoiler alert. No! Apparently Evil forces are at work in the mountains and suddenly….AVALANCHE!! Saren the female healer is down..possible exhausted dodging those pesky Werewolves. Never fear Valerius, who is well rested at this point carries her to safety. The situation is grim and Indel the Elf is not even in the picture, maybe buried in the Avalanche. 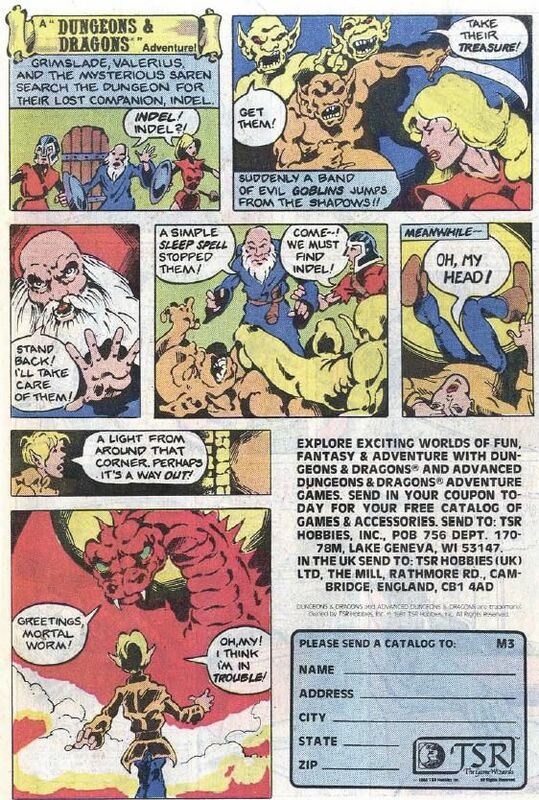 Grimslade opens up a Dimensional door using his magic scroll and whisks the company to an ancient castle where they remain to this day as the series of ads came to a grinding halt unresolved. So ends the series and this Satellite Transmission I just wish someone out there who has some artistic ability would publish at least one more page to wrap this story up! Any takers? Ill even publish it on the Superhero Satellite. 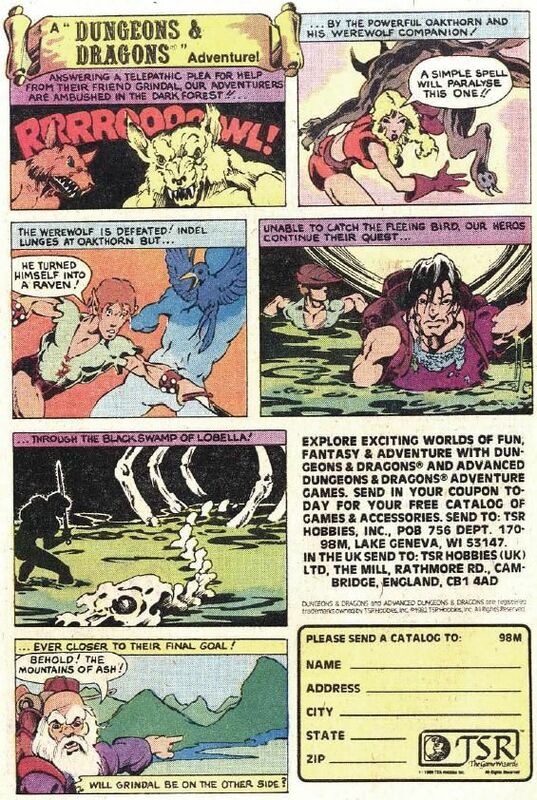 So our mission ends again heroes with fond memories of reading stacks of books and just wishing I had some extra cash to order these wonderful items from the back of the comics. Till next time, The Charlton Hero has other worlds to save.